There is a new kid on the block in the electric vehicle community, Le Guider International. 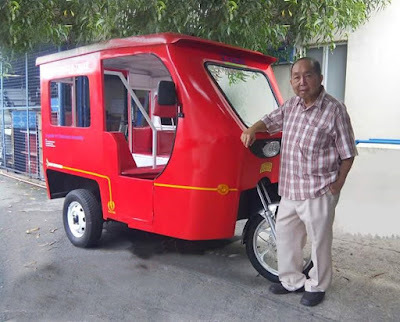 But this kid, this new, innovative company is guided by septuagenarian entrepreneur, 71-year old Mariano “Jun” Nocom and electric vehicle expert Engr. Youseff Z. Ahmad. Mr. Jun Nocom explains that age has made him wiser and that an advancing age has not stopped the creative juices from flowing in his veins. Using alternating current power with rechargeable batteries, he and Le Guider have developed several models of electric vehicles including converting two cars to EV, several electric tricycle models, an electric Jeepney and soon, even an electric bus which Engr. Youseff Z. Ahmad made in China. Engr. Ahmad says that the Le Guider electric vehicles boast of being a better alternative to internal combustion engine (ICE) vehicles. “It has less moving parts, less parts to maintain, is fully automatic, and does not need any special charging station since it plugs right on to a regular 220-volt wall socket”. Mr. Jun Nocom says that with these features, a Le Guider EV user can save thousands of pesos in fuel and maintenance costs, enjoys zero emissions and noise and has no exhaust and radiator cooling systems to worry about.